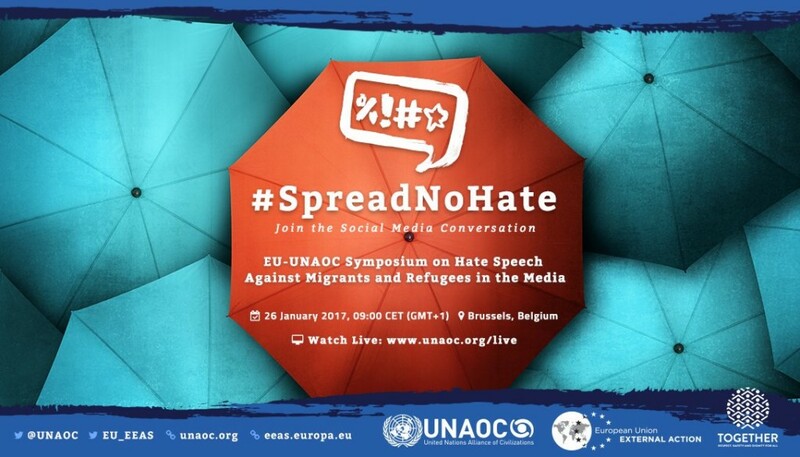 The European Union (EU) and the United Nations Alliance of Civilizations (UNAOC) organised a one-day symposium on Hate Speech Against Migrants and Refugees in the Media. EAVI was in attendance at the Symposium. The morning panel revolved around the question of whether it would be advisable to turn to authorities to obtain a higher level of news regulation. Is it a good idea or would state intervention and red tape limit one of the fundamental rights of humankind, namely freedom of expression? Moreover, who should be in charge of drawing the line between what is acceptable to say and what is not, keeping in mind that freedom of expression should always defended and enforced. Media regulators and authorities are faced with the dilemma of protecting freedom of speech whilst also avoiding incitement. The role of the media was also considered: should they act as gate-keepers or should they also be seen as champions of ethical and respectful narratives, educating the reader/viewer at the same time as they inform? Provided that everybody agrees on the fact that a minimum level of standards has to be enforced, so that victims of online violence are protected (not intruding at the same time into the sphere of freedom of expression), who should be in charge: national regulators or supranational organisms such as the European Commission? The EC, represented by Chiara Adamo, Head of Unit for Fundamental Rights Policy, DG Justice, is already working on measuring the audience perception of what might potentially be seen as a threat, with particular regards to the migrant crisis, in order to prevent prejudice and monitor which representations of Islam are prevailing in mainstream media and into the public debate. The Commission monitors this phenomenon by notifying IT companies on anti-migrant speech, which is by far the most widespread form of hate speech online. Apart from that, it is important to keep an ‘holistic’ approach: fighting hate speech is not enough. Policy-makers have to start again with grass-roots solutions at the community level, introducing educational programs and initiatives in order to promote integration. The afternoon panel, chiefly concerned with the rise of fake news and how to contain its spread and influence, hosted communication experts and representatives of prominent social media and IT companies, like Google and Facebook. The panelists encouraged cross-platform collaboration to counteract cyber-hate and limit exposure to hatred and violent users. People who harass and intimidate the others should also be reported to the authorities and prosecuted or cautioned. Under this regard, dialogue and coordination among IT companies, civil society and law enforcers is key. With a large influx of Syrian migrants to the EU and an increase of terrorist attacks related to Isis, fake news and hate speech are being used to turn against Islam. It is therefore important to educate the audience about what this religion actually is, clearing the field from misconceptions and prejudices. So the pivotal point is once again education and a stronger integration at community level. And as far as the regulation that is already in place goes, since around 40% of people get their news from Facebook, this site and other similar sites should be subject to the same laws already in existence on a national scale for publishers and publishing/editing companies. One of the most emotional contributions of the day was brought by Ms Cecile Kyenge, former Ministry of Integration of Italy in 2009, who made a strong point about the necessity to insist on education, having experienced first-hand manifestations of racism coming from colleagues in the Italian government.